The 2nd-ranked United States outlasted a tough 5th-ranked Russia squad to finish Pool C action with a 5-0 mark inside Kobe Green Arena Thursday. The loss drops the Russians to 4-1 at the FIVB World Championship. It was a thriller inside Kobe Green Arena, as the 2nd-ranked United States bested 5th-ranked Russia 3-2 to go undefeated at 5-0 in the first stage. 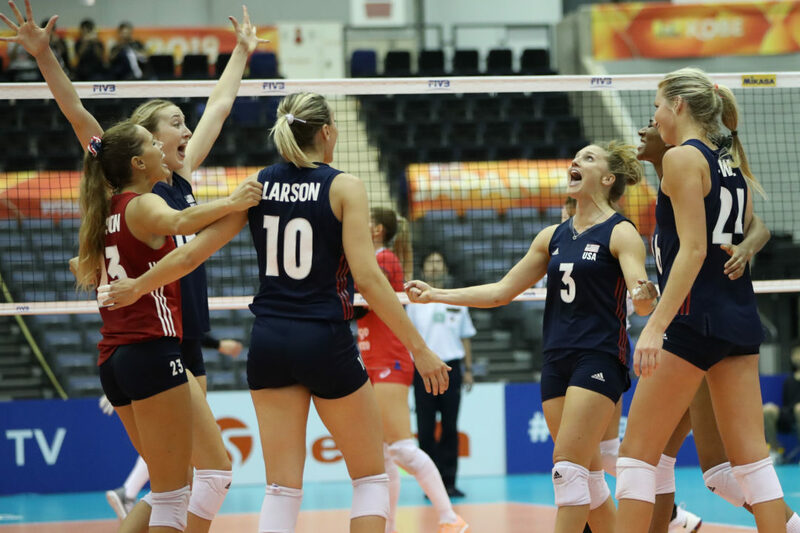 The Americans rebounded from a loss in the 1st set with wins in the 2nd and 3rd before the Russians earned the 4th set to force a 5th deciding set. The USA came out firing, using a 10-4 advantage to silence Russia’s offense and eventually claim the victory. Russia outperformed the United States on the block (15 to 13), but the Americans held the advantage on the service line (4 to 3). The Russians committed just 11 errors, while the USA had 14. Kimberly Hill led the way for the Americans, notching 19 points and 16 kills. Jordan Larson and Foluke Akinradewo followed with 16 points on 15 kills and 16 points on 12 kills, respectively. For Russia, Nataliya Goncharova led the way with an impressive 36 points, while Kseniia Parubets added 16. 16th-ranked Thailand came out on top in a tight 4-set matchup with 24th-ranked Azerbaijan to close Pool C action Thursday. The Thais continue to be without 2 starters, Kokram Pimpichaya and Kongyot Ajcharaporn, who sustained knee and ankle injuries, respectively, in FIVB World Championship play. Thailand held a slight edge at the service line, 4 to 3, but the teams were even with 7 blocks apiece in the match. Onuma Sittirak and Malika Kanthong registered the top two point totals for Thailand, tallying 23 and 16 points, respectively in the match. Polina Rahimova led the Azerbaijan attack with 25 points, while Jana Kulan added 14. 10th-ranked South Korea ended its FIVB World Championship experience with a victory in straight sets over 34th-ranked Trinidad and Tobago Thursday night inside Kobe Green Arena. The Koreans served up 10 aces and used a 10 to 7 blocking edge to earn the win. Park Jeongah led the Koreans with 26 points on 24 spikes, followed by Lee Juah, who contributed 14 with 3 blocks and 6 service aces. Channon Thompson and Darlene Ramdin led the way for Trinidad and Tobago, each tallying 14 points.